I loved the way this image turned – the kind of art I like to do! These orchids were sitting backwards in the grocery store and it just struck me how interesting they looked from this angle. So here is the shot I got with my little point and shoot. Since it was not the best quality image, I had to do quite a bit of manipulating to it and that included some major dodging to clean up the lines in the image. I can’t tell you how much I rely on Lightroom to help me clean up these JPGs from this little camera. There is no way I could get them looking this good without it. I did two major things in Lightroom – added David duChemin’s Lightroom 4 preset Honey on Land which turned the really purple and white flowers into rich pink and gold colors. Next I used the Lens Correction panel set to Color and manually defringed this image. It had some pretty bad yellow fringing going on. To fix this, the Remove Chromatic Aberration box was checked, and using the Fringe Selector Tool, the yellow area was clicked as a starting place. The final Amount for the Green Hue was 3 and the Green Hue tabs were set to 0/19. Unfortunately ACR does not have a Fringe Selector Tool but you can manually manipulate the defringe sliders and get very good results. This feature alone is one of the reasons you should upgrade to Lightroom 4 or Photoshop CS6. Now I will get off my soapbox. Photoshop is where the burning and dodging magic come in to play. Topaz (for website link see my Tidbits Blog sidebar) Simplify 4’s Watercolor II preset was applied. In an added layer mask, most of the flowers were painted back using a low opacity brush to reduce the effect of the filter on these areas. A Selective Color Adjustment Layer and a Hue/Saturation Adjustment Layer were added with some slight changes to the Reds and Yellows to bring back a bit of the purplish color. 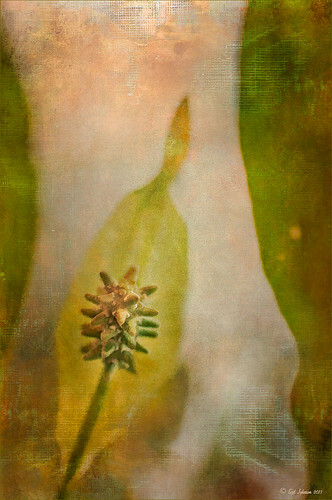 Next French Kiss Studio (for website link see my Tidbits Blog sidebar) Botanique2 watercolor texture was added and set to 70% at Normal blend mode. 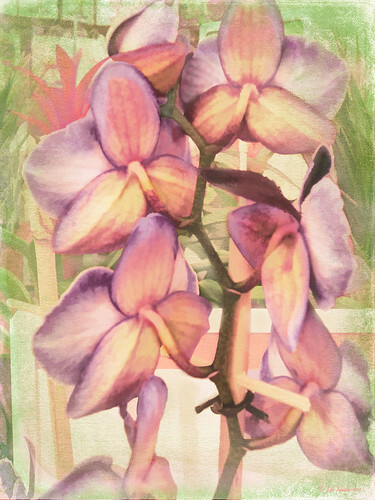 In a layer mask, the flowers were lightly painted back but the background retained the greenish colors. A Curves Adjustment Layer was added to add back the contrast lost with the texture. The next step is the Burning and Dodging tip that comes from John Paul Caponigro, one of the best users of Photoshop to create fine art and a total Photoshop guru, in a course he offers called Drawing with Light – 21st Century Dodging and Burning (Kelby Training also has the tutorial if you are a member – this DVD is excellent covering many topics to improve your images). 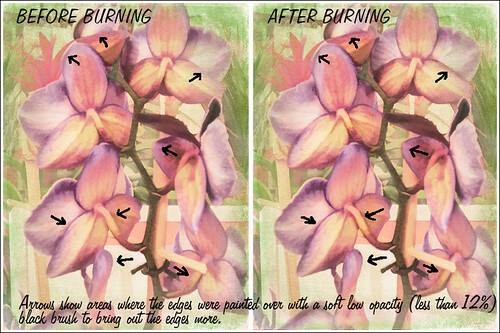 To add the burn effect to an image, a New Layer is created and set to Overlay blend mode. With a black soft-edged brush, paint over any areas or edges that need a little more separation. I like to use a very low opacity brush around 12% or less, but John Paul likes to use 100% and back it off completely. The reason I love this method is that it is easy to erase a mistake or add a layer mask to reduce the effect. If you make one stroke too dark, just go to Edit ->Fade and reduce its strength. Also the layer opacity can be reduced if the total result is too much – you may only need a 15-20% layer opacity to get the effect. If you have a lot of changes and want to Dodge some areas, create another New Layer set to Overlay and use the same brush set to white. Be careful not to overdo this – it is easy to do. The white paint seems to really stand out. But it is a very easy way to direct the eye to the important parts of the image. Remember the layer is set to an Overlay blend mode which means that anything greater than 50% gray brightens the image, and anything darker than 50% gray darkens it. Therefore, when black is painted over the darker areas of the image, only the dark areas are being affected – the lighter areas stay the same. When dodging with white, only the lighter areas are being affected. One thing to watch out for is that the Overlay blend mode tends to increase saturation, so make sure this is not happening. May need to use a Hue/Saturation Adjustment Layer to desaturate slightly. The last step for this image involved adding a Curves Adjustment Layer to bring in some overall contrast to the image. Textures can tend to flatten out an image. This image is of a little tiny hard pod or flower growing on my Peace Lily or Spathiphyllum plant. A macro shot was taken of the flower with filtered light from the south facing window that gives a really soft background feel. Before doing any darkening on this image, it was processed in Lightroom using just the Basic sliders. Next in Photoshop, Topaz (for website link see sidebar at my Tidbits Blog) Simplify 4’s BuzSim III preset was applied. 2 Lil’ Owls Mosaic Set Amour texture (see my Tidbits Blog sidebar for website link) was then applied twice. First time it was set to Overlay blend mode at 100% layer opacity. Second time it was set to Multiply at 100% opacity and the flower was lightly painted out in a layer mask. Finally the a New Layer was created and set to Overlay. In this case, the top of the pod was getting lost in the yellow of the leaf behind it and needed a little more definition. With a soft black lower opacity brush, the top of the pod was painted back to reveal the edge more clearly. This entry was posted on 03/09/2013 by sydspix. It was filed under Lightroom, Photoshop, Photoshop Filter, Textures and was tagged with 2 Lil' Owls Textures, Adjust, burning, burning and dodging, dodging and burning, French Kiss Textures, How to dodge and burn, Simplify, Textures, Topaz Simplify 4.